Beginning in 2011, insurers must devote at least 80 percent of the premiums they collect to medical claims or other activities that improve customers' health - leaving no more than 20 percent for the insurer's administrative costs or profits. Companies that do not spend enough on the right purposes will have to refund the difference to their customers in 2012. Consumer advocates have hailed the new "medical loss ratio" standard as a ground-breaking protection against profiteering by insurers. But the law's drafters were concerned that it could prove too onerous for plans selling to individuals, whose customer base is less stable and healthy than those of plans serving small and large businesses. So the law permits states to request temporary adjustments of the standard from the Secretary of Health and Human Services. Image by jdlasica via Flickr Nate Silver looks at several aspects of the Palin attraction and has some suggestions for how she might win. It is a long piece with a lot of wonky analysis, but still interesting. Some I do not agree with, but it seems pretty early to be making a prediction on how things will play out when there are so few declared candidates. Right now Huckabe seems to be a front runner which kind of surprises me. While he is a charming guy, he is not all that conservative and I am not sure he can play well with Tea Party voters. I think the Tea Party will be as energized if not more so in the 2012 campaign. That will probably help Palin if she decided to run. Right now she has to decide what is best for her and her family. She has made a lot of money in the last year, but she could probably make a lot in 2012 if she did not run. She could still be a credible candidate in 2016 if she decides to wait. An anti-war demonstrator who hurled a pie at the chairman of the Senate Armed Services Committee in August was charged Thursday in the attack. Ahlam Mohsen, 23, of Coldwater, Mich., faces a count of assault for hitting Sen. Carl Levin (D-Mich.) in the face with an apple pie, and another count of assault on a federal officer. Her friend Max Kantar of Big Rapids, Mich., was also charged with the same counts. She told the Big Rapids Pioneer she hoped "to send a message that liberals and Democrats are just as implicated in the violence (of war) as the Republicans. "She now finds her self implicated in the anti war violence she embraced. She should be sentenced to having a pie shoved into her face and Sen. Levin should get to pick the flavor. I think minced meat would do nicely. Heavy snow and strong winds has shut down major roads and left urban areas in a whiteout as winter storms now batter the U.S. West Coast. States in the west were hit by blizzards in mountainous regions and heavy rain at lower levels, cutting power to thousands of homes and triggering hundreds of accidents. 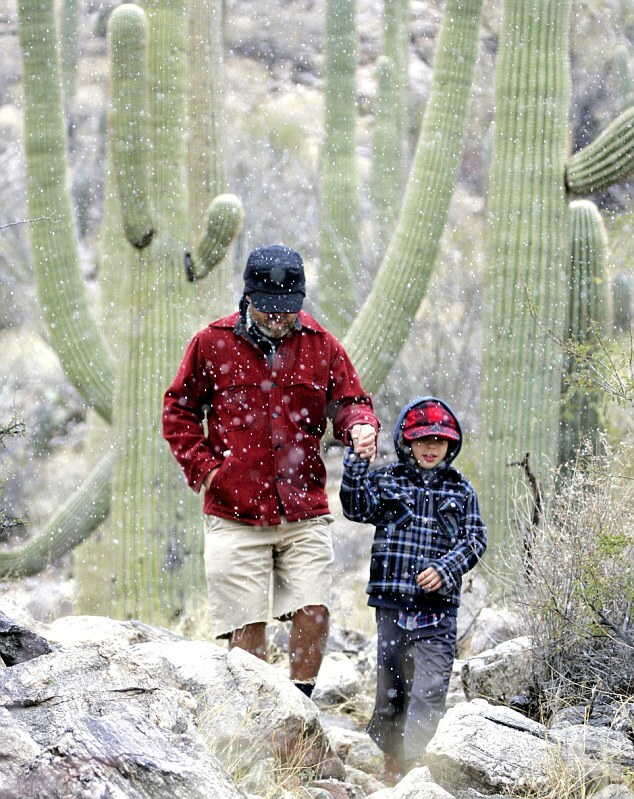 Even the relatively warm Phoenix desert area has been hit by the freezing weather, with heavy rain and residents warned to expect rare icy conditions. Snow and ice forced the closure of parts of Interstate 17 and 40, the two major thoroughfares in northern Arizona, stranding hundreds of motorists south of Flagstaff and the Grand Canyon. Abel Gurrola was stuck for several hours on the I-17 as he drove north with his wife and three sons. An Obama administration directive designed to preserve more public lands as wilderness is stirring anger in the West, where ranchers, sportsmen and energy companies say they could lose access to acreage they count on for their recreation and livelihood. The regulatory change, initiated this month, directs the Bureau of Land Management to survey its vast holdings stretching between Alaska, Arizona, California and Colorado, in search of unspoiled back country. The agency can then designate these tracts—potentially millions of acres—as "wild lands." Protections will vary from site to site, but in general such lands will be shielded from activities that disrupt habitat or destroy the solitude of the wild, according to the Interior Department. That might mean banning oil drilling, uranium mining or cattle grazing in some areas. It also could mean restrictions on recreational activities, such as snowmobiling or biking. Come January, as Texas lawmakers begin work to pass bills and tackle the yawning budget gap, they will go up against a simple but implacable barrier: time. Texas is one of a dwindling number of states whose legislatures hold scheduled meetings only every two years. Just three other, far less-populous states — Montana, Nevada and North Dakota — still have biennial legislative sessions. For Texas legislators, the challenge will come into stark relief when they must plug a budget gap that could top $20 billion for the fiscal years 2012-13; the state’s general revenue funds budget for the current biennium, by comparison, is estimated at $87 billion. They must make major financial decisions and plan budgets that will stand for the next two years at a time when the economy is difficult to predict. It is partly because of the challenges associated with biennial budgeting that most states moved to annual sessions. Ignore the revisionist hype in sections of the liberal media about President Obama staging a (mythical) political comeback – this is a presidency with an approval rating of 45 percent (according to the RealClear Politics poll of polls), that presides over a nation where just 27 percent of voters think the country is moving in the right direction, and which just 29 percent of Americans think will be returned to power in 2012. The White House may be claiming a couple of political wins in the dying embers of the lame duck Congress after expending a great deal of political capital in the Senate over the reckless ratification of the Moscow-friendly START Treaty and the repeal of Don’t Ask Don’t Tell, but these are issues barely on the radar screens of most American voters in the lead-up to 2012, an election which will be dominated by the economy and health care reform. The media establishment that hyped this Democratic president but refused to be humbled with him. Pundits' premises so fundamentally disproved. The conservative collapse that was not. The so-told emerging liberal era that was not. The Democratic leaders who bought the hype, acting on the masochistic premise that if big liberal things were done, the American mind's apprehension to big liberal things could be undone. The hapless Republican generals saved by conservative foot soldiers. A liberal opposition that, all over again, undid itself in Pyrrhic victory. It was a year of conventional irony. Officials in India and Iran scrambled Thursday to keep the $11 billion in oil and gas trade between them going after India’s central bank declared last week that a regional clearinghouse could no longer be used to settle such transactions. The move, which was long sought by the United States as a way to tighten sanctions against Iran, makes it tougher for Indian companies to buy Iranian oil and gas because they can no longer use the Asian Clearing Union, which was set up by the United Nations in the 1970s to ease commerce between Asian countries, to handle payments. The clearinghouse allowed Indian companies to pay Iranian companies via the two countries’ central banks. But it also meant that the transactions were less transparent, making payments to companies linked to Iranian companies controlled by groups banned under the sanctions regime more obscure. As part of an international criminal probe into computer attacks launched this month against perceived corporate enemies of WikiLeaks, the FBI has raided a Texas business and seized a computer server that investigators believe was used to launch a massive electronic attack on PayPal, The Smoking Gun has learned. On December 24, a research report from the South Korean Foreign Ministry Institute indicated that North Korea would carry out another nuclear bomb test after the beginning of the year. -- South Korean media reported earlier this month that the North was digging a tunnel in preparation for such a nuclear test. The war for Taiwan starts in the early morning. There are no naval bombardments or waves of bombers: That's how wars in the Pacific were fought 70 years ago. Instead, 1200 cruise and ballistic missiles rise from heavy vehicles on the Chinese mainland. With the federal government set to regulate climate-altering gases from factories and power plants for the first time, the Obama administration and the new Congress are headed for a clash that carries substantial risks for both sides.